The PNG-A is a high precision generator used in Test and Measurement instruments calibration. It is a Signal Generator with precisely computed phase and amplitude noise characteristics. With its wide frequency offset range, 1Hz to 1 MHz offset, and its programmable Phase and Amplitude noise in real time, this is the ideal standard to calibrate phase noise analyzers, Signal Source Analyzers and Spectrum Analyzers. The PNG-A can also be programmed in Random and Deterministic Jitter in order to test Oscilloscopes or even test clock recovery systems or receivers in the presence of noise or jitter. 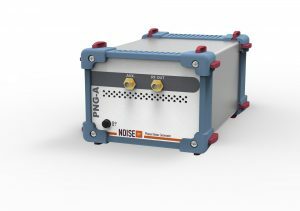 Much more flexible than traditional noise sources; the PNG-A allows the user to tailor the noise shape and its Phase and Amplitude distribution.